Has fantastic fall color and charm going for it. There's only one problem with this sweet rose family member and it's not the plant's fault. It's mine. I have it planted in the wrong spot. It's too cute to be hidden away when it packs this much color punch every fall. This plant needs to be seen to be appreciated~That way visitors to Clay and Limestone will be sure to see it's many charms. It's an easy-peasy native plant that is found naturally growing in rich woods on calcareous soils in a good portion of the Eastern US. They seem undeterred by the dry conditions in my garden, but, I do think they would be happier with a tad more sunshine, richer soil and room to spread to their full growth possibility~three foot tall and wide. The small (one inch) star shaped flowers bloom modestly each May despite their less than ideal growing conditions. I find them very charming and have visions of this subshrub (small woody plant) massed in that same wildflower border with some other plants edited out! The red stems look good with Aquilegia canadenses, Heuchera villosa and Pentemon digitalis. I think this plant would work beautifully in a small garden near a path where the small flowers would make a nice statement in the shade. Bowman's Root or American Psychic was introduced to me as Porteranthus stipulatus but, it is also known as Gillenia stipulata. Both are correct. Whatever you know it as, it's a sweet little plant for your garden. PS You might be interested to learn that a pink flowered Porteranthus trifoliatus has been discovered. Yes, it's on my list! 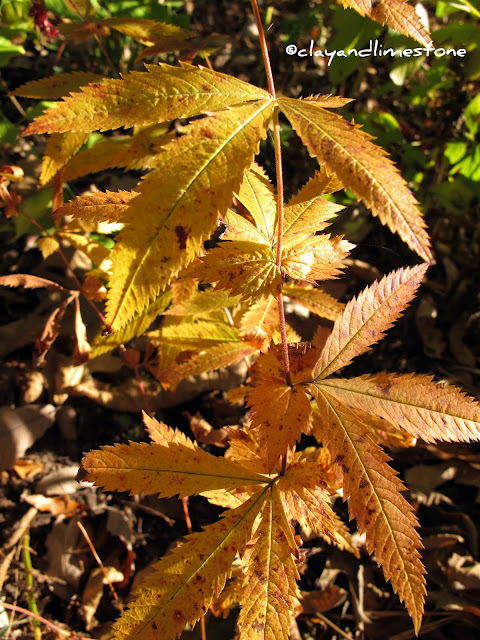 The two Porteranthus differ in leaf shape. P stipulatus has two leaf-like stipules at the base of each leaf which gives the appearance of being two smaller leaves. P trifoliatus doesn't. Gail Eichelberger is a gardener and therapist in Middle Tennessee. She loves wildflowers and native plants and thoroughly enjoys writing about the ones she grows at Clay and Limestone. Dear Gail, you write the best advertisements for native plants! This one is a winner and will surely become very popular in the future. Pink flowers? I'm in! Gail, I've struggled with the same issue on a couple plants in my garden, including this month's contribution. Do I put it in the wooded area where I will rarely see it but it's likely to do really well, or bring it up closer to the house where I can constantly admire it and hope for the best. Like you, I chose to put the cranberry up close to the house where I can see it but I have put some plants, like my native witchhazel, in a back corner where I tend to miss it but the plant has thrived tremendously. Tough call. This has been on my list forever! Very nice and I appreciate the pairings you suggested. It seems shade plants are the name of the day here in Tiger Gardens. I did not realize Bowman's root had such nice fall color. It is a real beauty. Love the fall color. Gail I love this plant profile. I have heard of it but not seen it...and it has a white bloom. perfect for my white garden perhaps but will be adding it to the list..thx!! I so enjoy reading about plants that you have on the eastern side of the country...always something new to learn! You and Frances both have so many plants that are unfamiliar to me. I love that! I'm always amazed each month at the little gems hidden away in your garden, Gail! This is another new-to-me plant, but what a charmer. From its sweet blooms to its fall color, this looks like a winning native. Hi Gail - I think it's flowers are so interesting looking and what a bonus to have superb autumnal foliage aswell. Hi Gail. I entered but this is always a hard one for me. I have many, many 'natives' in my garden, but not those listed on the list for NYS, so I always feel odd calling them natives. So I entered those found in the park. And even there many are imported plants that become invasive. But they are pretty at this time of year. Gail, I have Gillenia trifoliata - am going to check to see if it's the same, or different from yours. It also has - good fall colour right now. Know what you mean about giving such pretty plants better locations (for us), but have discovered on several occasions that these woodland charmers do best in and amongst their other shady friends. Although, looks like you've got some seed there - perhaps a little clever scattering is in order - it never hurts to try. p.s. I've always had trouble taking photos of the flowers in the spring - no excuses after seeing your shot - I'm going to better next year! hi gail, it's always fun to learn about a new plant; yours is another i didn't know. i like that fall color. i posted about seaside tansy today. i hope you enjoy. happy wildflower wednesday! I would grow this plant just for the name: Indian Psychic. (I have searched far and wide for a psychic plant!) And it is so pretty as well, especially the flower I think. Dear Gail, I should love to sit on your purple bench and admire this beauty. Its fall color will look gorgeous near your bench. Lovely and delicate. With the name "Bowman's" Root I really should have a stand of this in the garden. I don't know why I haven't sought out this plant. It is pretty and I love the fall color. Interesting native plant, not sure I have seen this one yet.....though, once I read about some of these natives, all of a sudden I notice them in my area! Thanks for a great posting. I love Bowman's root, too, and I don't know why we don't plant more of it in our gardens! I know it as P. trifoliata, but haven't kept up with its name changes. And I kept forgetting about Wildflower Wednesdays, too. But, thanks for all of your good posts about Southeastern natives. What a cool plant! Happy Wildflower Wednesday! I've heard of that plant, but don't know if it grows here. It is a nice looking plant, but I don't have enough shade for it. Thanks, Gail, for hosting Wildflower Wednesday. Bowman's Root is new to me. Pretty flowers and fall foliage, too! And I have plenty of shade. I'm going to check with the County Extension Office - perhaps they can guide me to a source. Thanks to all of you who have posted here. I've enjoyed reading and looking at the photos. Neat! I like the gold fall color. I do love Porteranthus/Gillenia. Mine is at its peak of color right now. I need to get the pink-flowered form too. Indian Psychic is new to me Gail - what a pretty plant. I love the fall color, the delicate blooms, and it's a perfect size for a small woodland garden. Thanks for introducing this little shrub to me. I'll be on the lookout for it here! Thanks for hosting Wildflower Wednesday. I always learn so much from everyone's posts! That is one high impact plant!!! Wow, what a welcome burst of color in the fall that must be. Hi Gail, Thank you for introducing a plant I've never heard of. I'm intrigued. The blossoms are lovely and the fall foliage is very nice. Looks like a nice addition to the garden - dainty white flowers and fall foliage to boot. I like the name "American Psychic"! I've been meaning to join the Wildflower Wednesday meme, Gail. I just had a crazy, hectic summer. But I hope to join in the fun next spring. Will you keep the meme going during the winter, or will it be under a different name? I picked up some of the pink Bowman's root a month or two ago--and it either died instantly or went dormant in rage, one of the two. I'm hoping it comes back next spring. Have you found them finicky upon transplant? Ursula V - dormant in rage ;~(0) also in my garden. Some plants just fade away as you watch. I miss autumn colour, that's why I cheat with Japanese maple and Prunus nigra. Hi Gail, I love this plant, too. I believe Indian Physic is P. stipulatus and Bowman's Root is P. trifoliatus -- closely related but not the same plant. Indian Physic grows wild here in middle TN; Bowman's Root prefers things a bit further north. Of the two Indian Physic grows much better hereabouts in my experience. It's easy to propagate from seed, too. Love the plant and all of the aliases! Great photos and info (as always). Have a great weekend and stay....warm? dry? whatever the weather...it's changing! Hi Gail! You always have something interesting to show! I don't know this plant. I love its star shaped flowers and its leaves are very attractive! I make mistakes with putting plants in wrong spot. For example, my blue poppies didn't bloom at all last summer. I will try to find a new location for them with more sun. Or maybe they just need more time to get established?